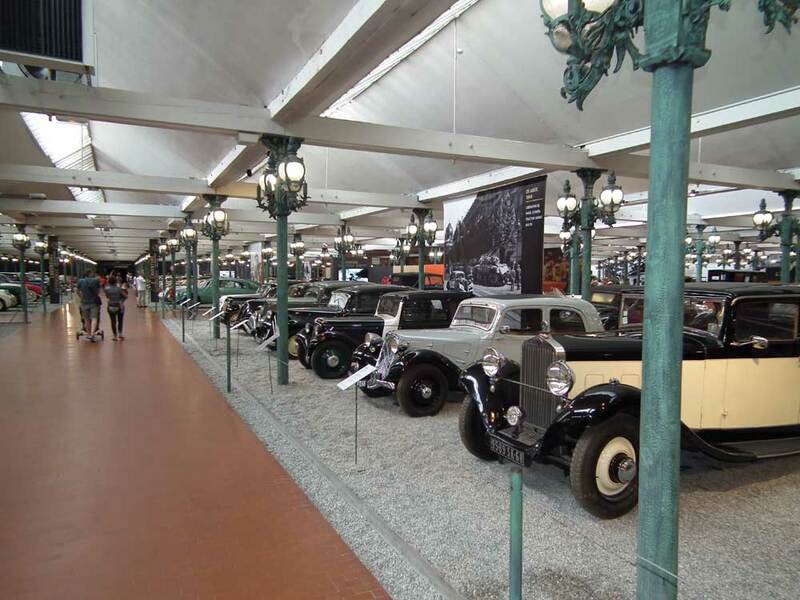 On our way up to Switzerland we broke our journey in Mulhouse, staying two nights so we could visit the (rightly) celebrated Cité de l'Automobile. Based on the extensive collection of the brothers Schlumph, but now the national car collection of France, it claims to be the world's largest car collection. 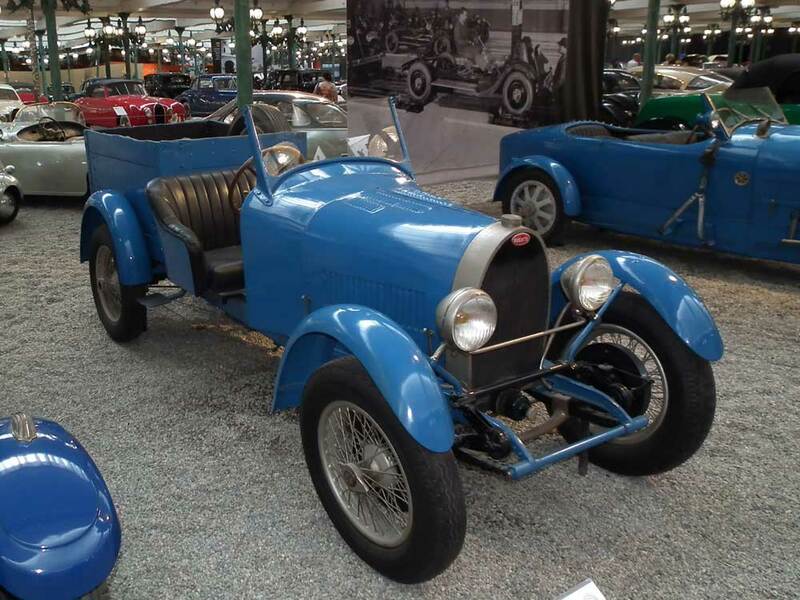 Having been to a few car collections in my time I can see no reason to doubt it - it's enormous! Being based in the old woollen weaving mill of the Schlumph brothers they have plenty of space, with 2 hectares (about 5 acres) of factory onder one roof. 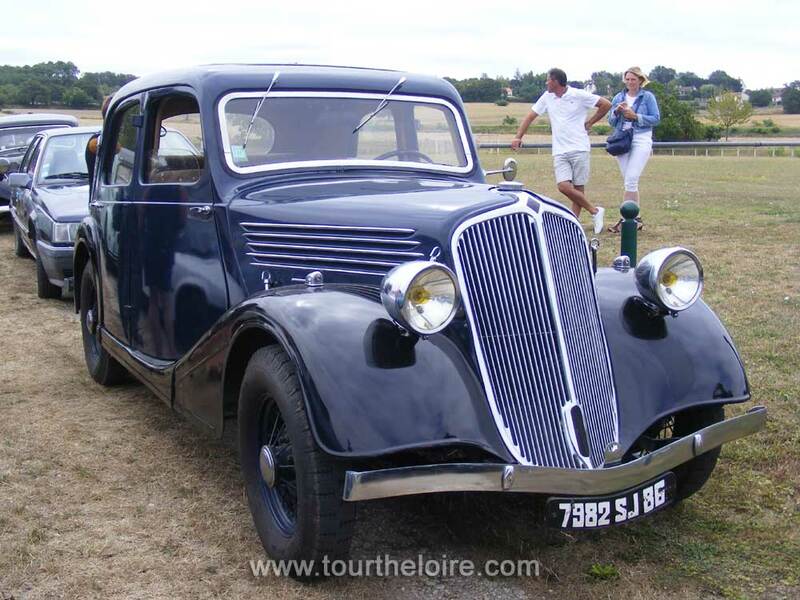 The grey and black Citroen Traction Avant is a 7A of 1934. We had a great time at the museum, which is a properly curated collection, with a couple of display spaces for special exhibitions. It also has a very fine cafeteria selling good meals at extremely reasonable prices. What's not to like? This is the way to descend (and more importantly, climb) mountains! 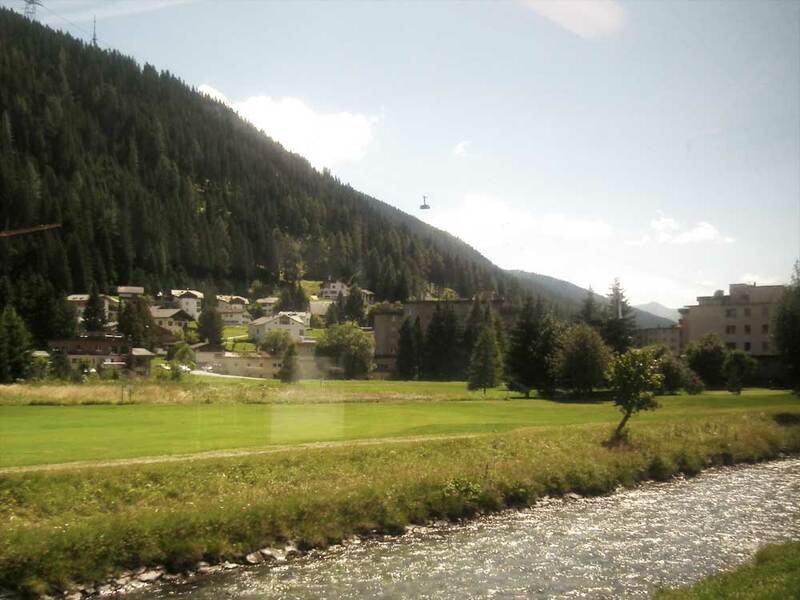 From Jakobshorn at 2590metres, to Davos Platz at 1540 metres in little over 8 minutes, the voyage uses two cable cars, changing at Jschalp (1931metres). And don't forget - all of this is free! First a banner goes up on the town hall in Preuilly. It says blood will be collected on Saturday morning. 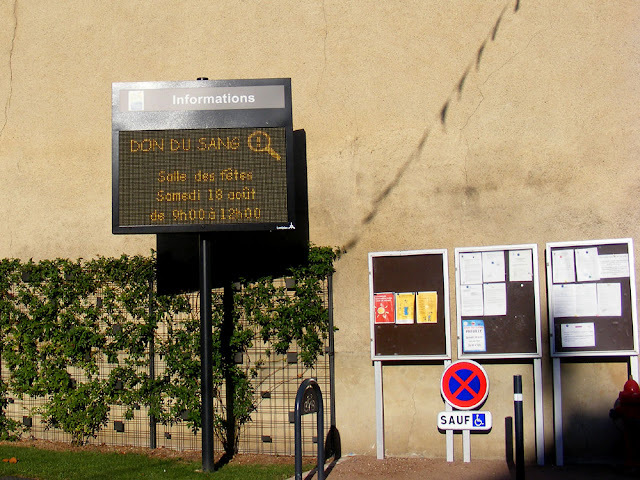 Then the electronic message board shows that you can give blood at the Salle des Fêtes between 9am and 12pm on Saturday 18 August. 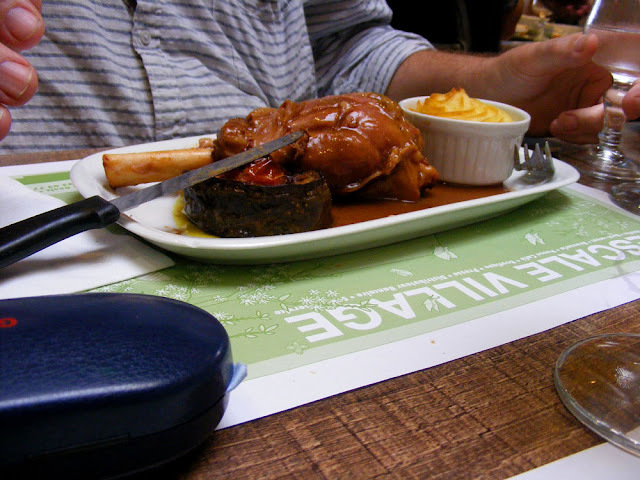 Prompted to go after a blog post by TasteFrance I put it in my diary. I needn't have worried though. 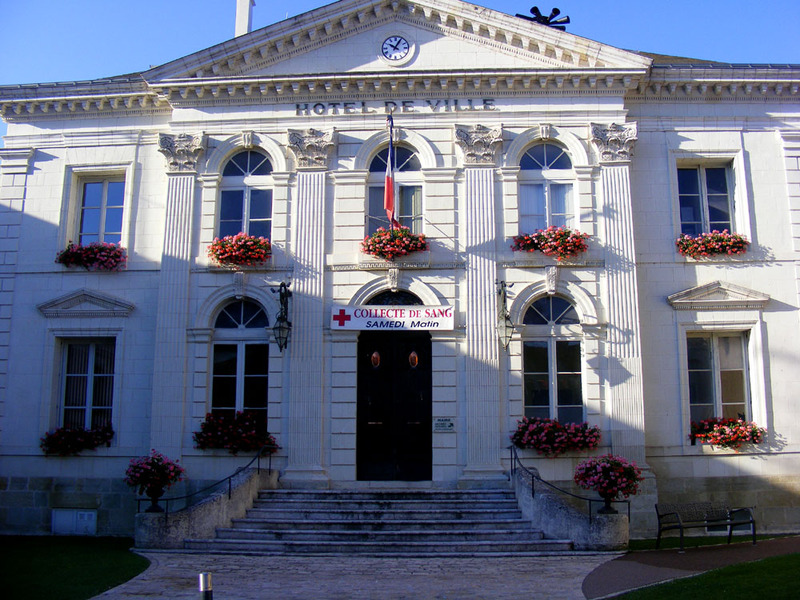 At 8.30am on the appointed Saturday morning a Red Cross van cruises up and down Preuilly's streets with a tannoy, urging the inhabitants to pop in and give blood. 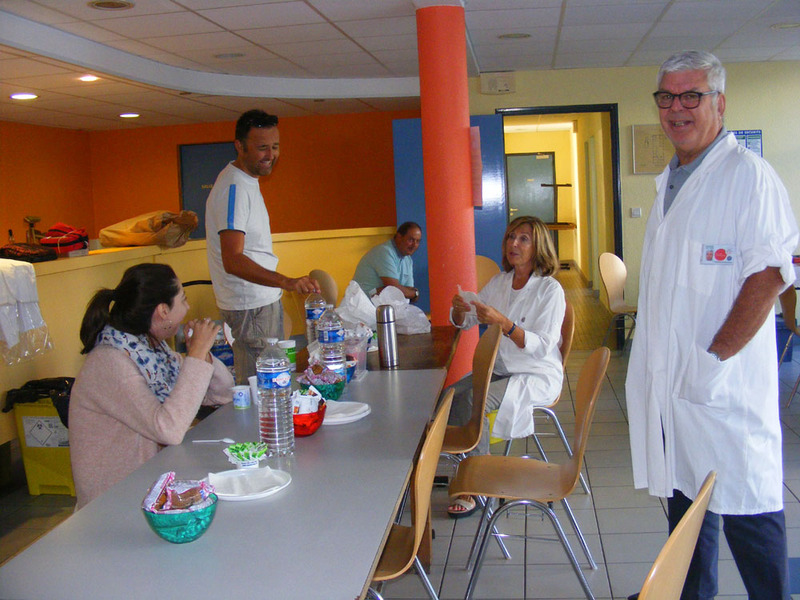 When I get to the Salle des Fêtes just a few minutes after 9am the blood team are finishing breakfast. Half a dozen donors are already there. I am given a bottle of water and a four page questionnaire to fill out. I haven't got through more than a few questions before an administrator calls me over. She needs to register my details (name, address, etc) on the computer, and her colleague needs to do a prick test to see that my haemoglobin count is high enough. It has to be over 12 I'm told, otherwise I'm probably anaemic. Mine is 14, so that's OK. I go back to filling out the form. There is a question about whether I had lived in the UK for a year or more between 1980 and 1996. This is to eliminate the risk of those who might have been exposed to Bovine Spongiform Encephalopathy (otherwise known as Mad Cow Disease, which leads to a terrible human disease called Variant Creutzfeldt-Jakob Disease). I was in the UK in 1995, but only for 3 months and we didn't move there until 1997. However, many British people now living in France cannot give blood in France because of this. There were the usual questions about sexual activity and drug use and lots more questions about where I'd been in the last twelve months, even in transit. Also a question about Hepititis B and Tetanus vaccinations, and one asking if I planned to do anything sporty immediately after giving blood. I said I planned to go swimming if I felt OK. Finally I finished answering all the questions and was called in for an interview with a doctor. She went through the form with me, clarifying some of the answers and entering it all on the computer. She asked me what I'd eaten for breakfast (muesli with milk and a cup of coffee which got a nod of approval). Swimming afterwards was deemed foolish though. I couldn't remember the date of my tetanus booster, but it was in the last year so we took a near enough is good enough approach with the date. The fact that I had been in China and Australia was not a problem, but I got quizzed about where in Italy I had been. I explained that I had stepped into northern Italy across the border in the Alps for less than an hour three weeks earlier. No matter, it was enough to halt the whole process. I couldn't give blood that day because there is currently a virus in Lombardy and around Venice that they don't want to be passing on. There needs to be at least a month between visiting those parts of Italy and giving blood. The doctor said that she was rejecting a lot of people for that sort of reason because it was the holidays and people were travelling a lot. Two nurses on the left, two doctors on the right and a donor in the background. I was invited to partake of a biscuit and some cordial nevertheless, thanked and sent on my way. So I went swimming. I think the blood team come to Preuilly three times a year, so I will keep an eye out for them and be ready next time. One market day recently my neighbour Sylvie stopped me in the street and urged me to put 25 August in my calendar. 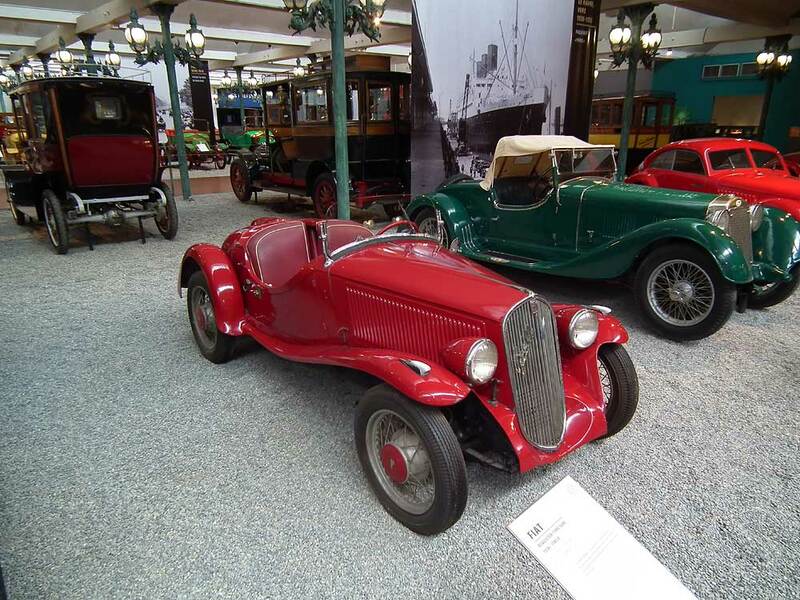 Her daughter Ninon would be playing with her band Le Caribou volant at the new guinguette in Preuilly at five o'clock on that date. I sent a message to everyone in the Claise ConneXion to say we'd be there and they were welcome to join us. I explained to the anglophones that a guinguette is a temporary space for music, dancing, drinking and eating with friends, set up on the banks of a lake or river. 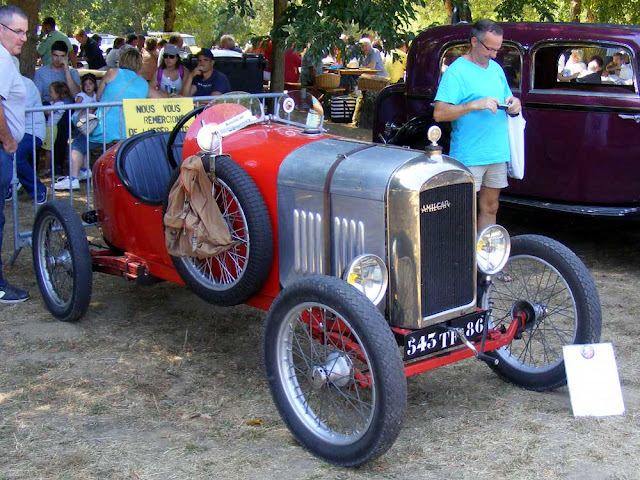 They are very much associated with the 19th century in France (there are several famous Renoir paintings set in a guinguette) and are undergoing a popular revival at present. Our commune (local authority) has built a large solidly permanent new shelter at the recreation grounds and has dubbed it La Guinguette. 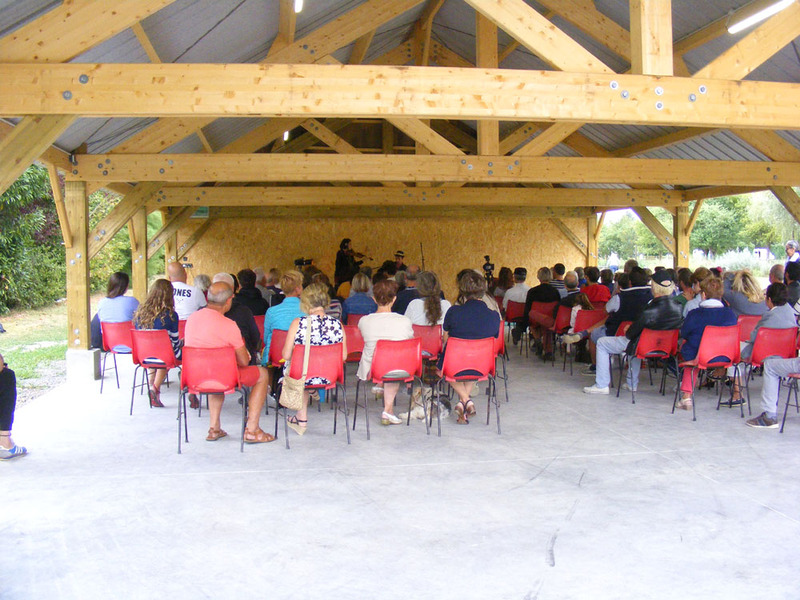 Throughout the summer little concerts have been staged there, and the local councillors run a bar in an adjoining shelter. The concerts are free and the bar is to raise a bit of money for future events. 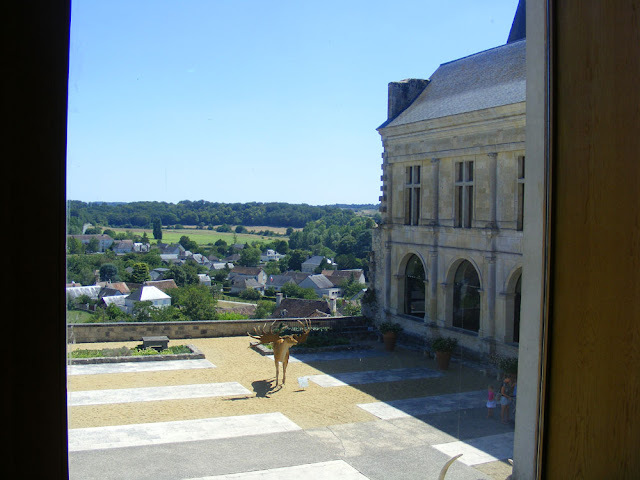 We loved Le Caribou volant, as did all our friends, although they were not at all what I was expecting. I thought they would play traditional, well known French chanson and folk music, including plenty of singalong and dance numbers for the audience to get involved. As it turned out, there wasn't a single cover version and no dancing, but they were clearly in fact part of the chanson tradition of songs in which the words are more important than the music, which must consist of catchy tunes so you can sing along easily. Simon described their style as being as if Bob Dylan had met up with Bob Marley to play gypsy music (manouche) together. I suspect the Caribous would take that as a compliment. Their musicianship was good and French and Anglos alike enjoyed their performance. I was still engaged with meeting and greeting when they played their first song. Their second song made me sit up and take notice though. It was about climate change! We also got a song about Britain and Burger King (with a Brexit joke), one about high street (main street/rue principale) shopping and one where the small town rural audience got to sing along about how Monsanto was bad for your health!! I had made a pound cake which I distributed to friends (and a few strangers who blatently asked for a slice) during the interval. Pound cake is called quartre-quart in French and mine got rave reviews from my French friends. I had made it deliberately because it is the sort of simple dense cake that French people love. As ever when French people like food there was much discussion about the ingredients and method. 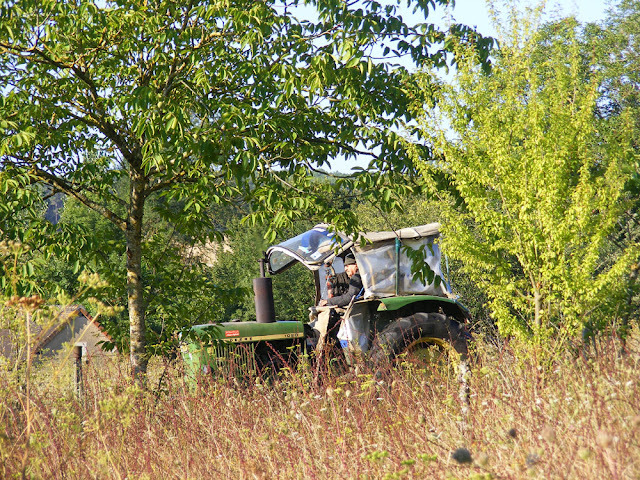 Last Sunday morning the Aged Orchard Neighbour came with his tractor and slasher to cut the 'grass' at the orchard. It took an hour and a half, the same time as it took me to do the potager with the push mower. This is the first time I have asked him to do it, and I had to endure a public ticking off about how many weeds there were and how I don't mow enough to keep things under control. 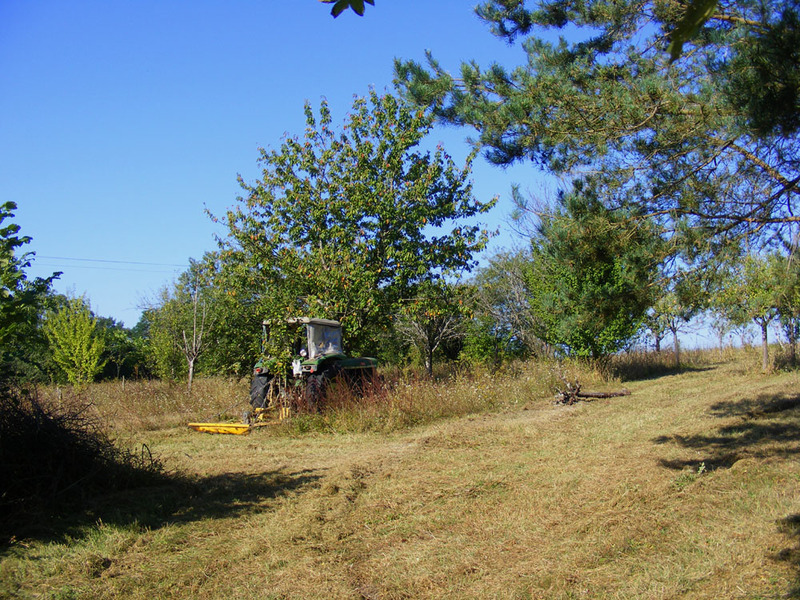 This is the only time of year I can let him loose in the orchard with a mower because he can't mow over something he's not supposed to. With the heat and dry the orchids have all gone dormant and disappeared underground for a month or so. At the end I was very glad to have it done, but it was not without cost. He managed to reverse into the pergola and knock part of it down. 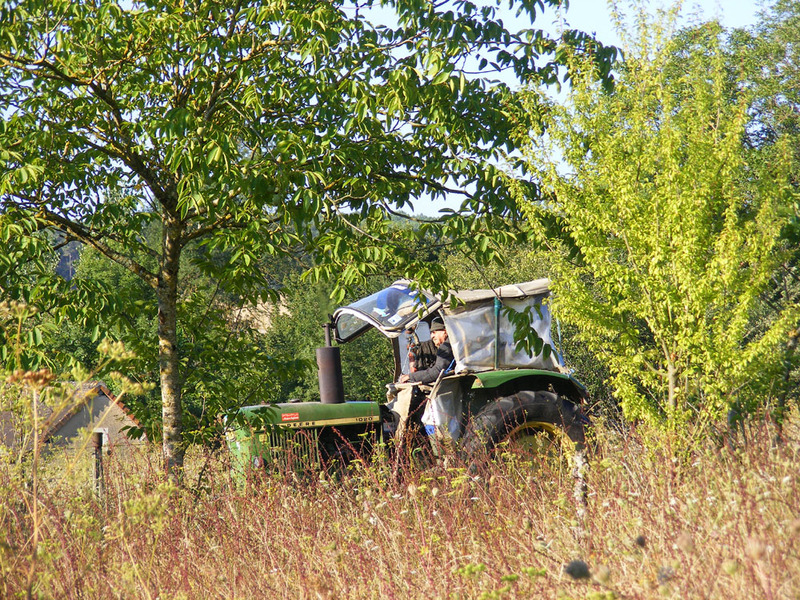 And just as I finished the potager the self-propelled function failed on my mower. 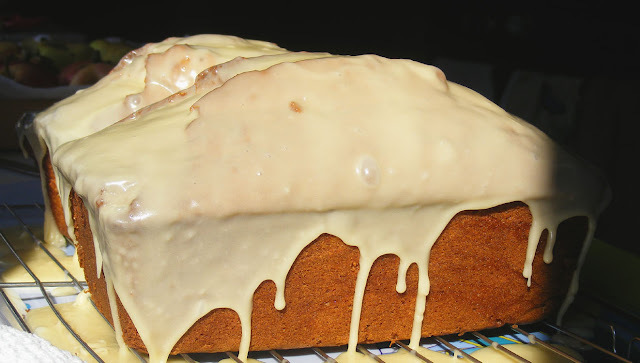 Anyway, I've made the Aged One a pound cake (Fr. quatre-quart), his favourite. I'll give it to him at the Thursday market. 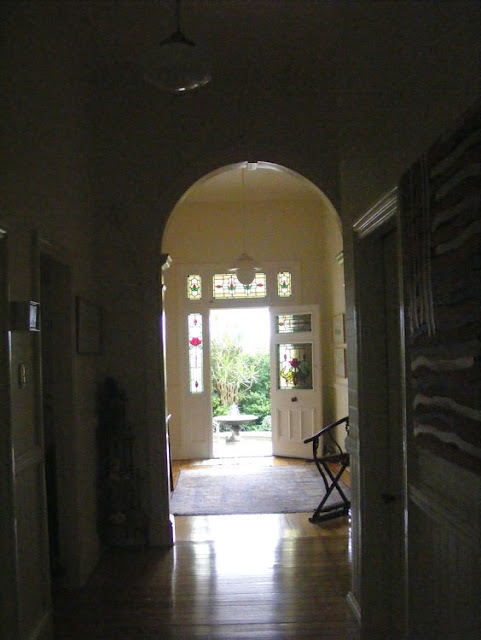 The home of our friends Christine and Geoff in Australia. We met them in France and stayed with them in Lismore in January. 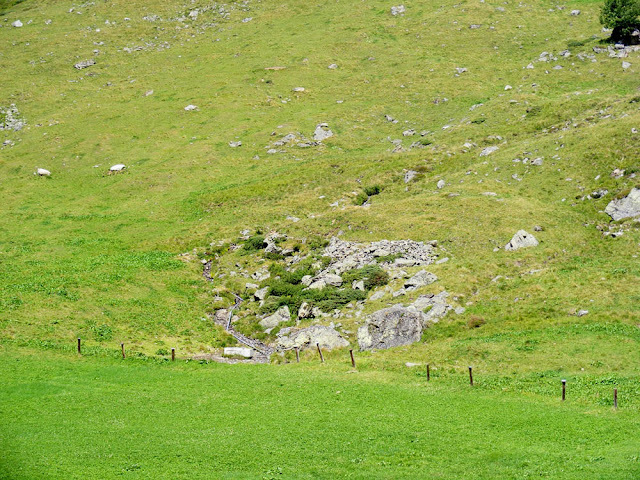 Our furry mammal fix in Switzerland was provided by the Alpine Marmot Marmota marmota. 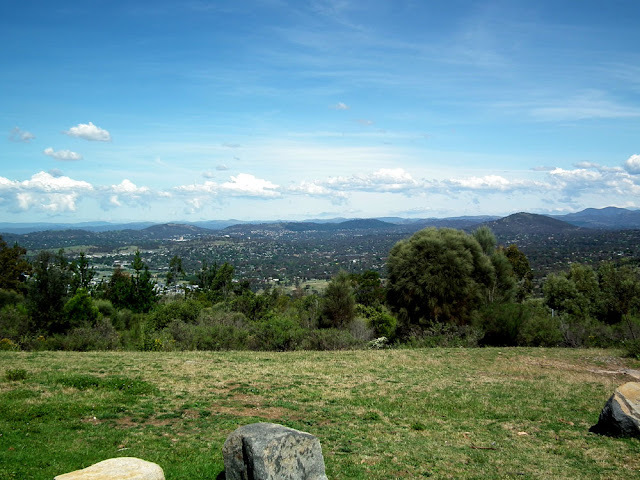 There we were, minding our own business and picnicking on some rocks up a picturesque valley when something on the hillside started shouting. At first I thought it was a ground nesting bird making an alarm call, but after some scanning of the surrounds with the binoculars (which I'd been lugging around in my backpack for just such an event) I spotted these two critters on a pile of rocks. We were I suppose about 150 metres from them, and the path being used by a steady stream of walkers and mountain bikers was maybe 100 metres from them. Despite that, we were obviously too close for the guard marmot's liking and it made a repeated and piercing call. 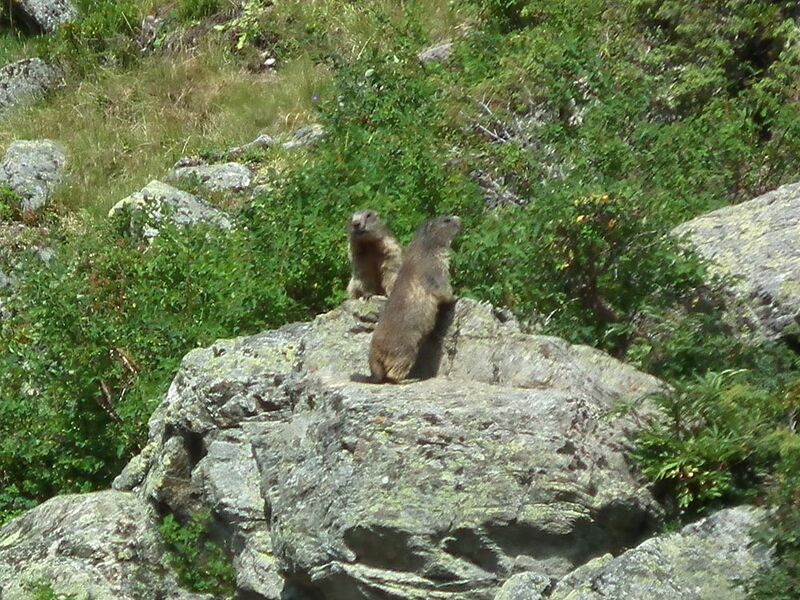 In the end my photos show three marmots in all, but at the time we only noticed these two. Two of our three marmots. We all remarked on how unexpectedly large they are -- nearly the size, and a not dissimilar shape, of a corgi. As our friend Antoinette subsequently pointed out, we only got to see them because we were there in the summer. They are very familiar to anyone who hikes through these alpine areas in the summer as they draw attention to themselves with their vocalising. But anyone who only visits during the winter for the skiing will never see one -- they are all underground and hibernating. Once we knew what they sounded like we heard them in a number of places and I spotted one on a rock as we drove by further up the valley, but we never saw any others. Photo courtesy of my sister-in-law Rosy. We were at about 2000 metres when we saw them and they live in the mountaneous areas between 800 metres and 3200 metres. They are in fact the largest member of the squirrel family, and have thick grizzled fur, a mixture of blond and dark grey with a bit of red in places. 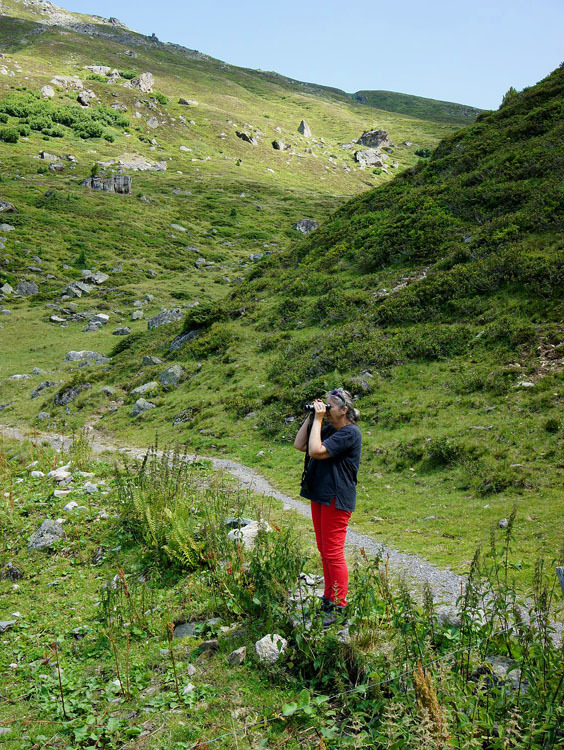 Our marmots appeared to be typical, living in a rocky outcrop in the middle of alpine meadow. They are very sensitive to heat, sometimes not emerging at all if it is a hot day. Their diet is omnivorous, a mixture of tender young plants, worms and insects and they can live for 15 years. Where the marmots were living, photographed from where we were picnicking. The new season's apples are in. I've picked a few from our trees but they'll hold for at least a month on the trees. 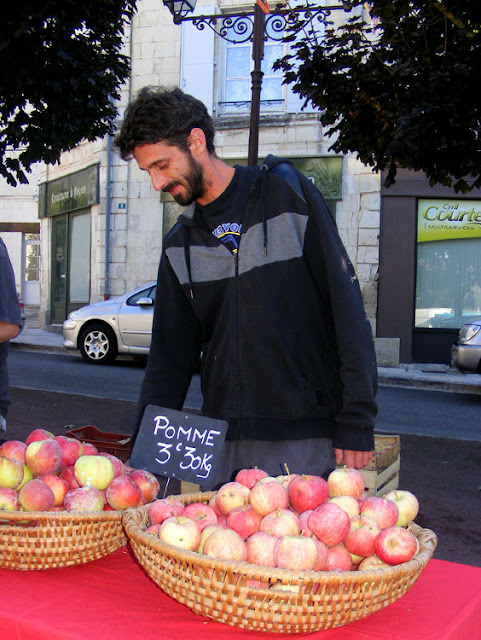 The local organic orchard, Les Jardins Vergers de la Petite Rabaudière, have a couple of varieties at the market now and they've made some new apple juice. The mystery apple is on the right. Tony the Organic Orchardist had a particularly nice crisp sweet apple last Thursday. He says he doesn't know what it is and he only has one tree of it. Last Friday Antoinette and Niall joined Susan and I for an apero style tea before we headed off to the garden at the back of the Mairie for an evening of Moliere and Lully. The play itself is a fairly standard 17th century comedy of manners, about a particularly vain man and his social aspirations. Mix in his (of course) much cleverer wife, an elocution lesson, a daughter who he won't allow to get married, and some disguises (and a false moustache) and you have the perfect light weight evening's amusement*. 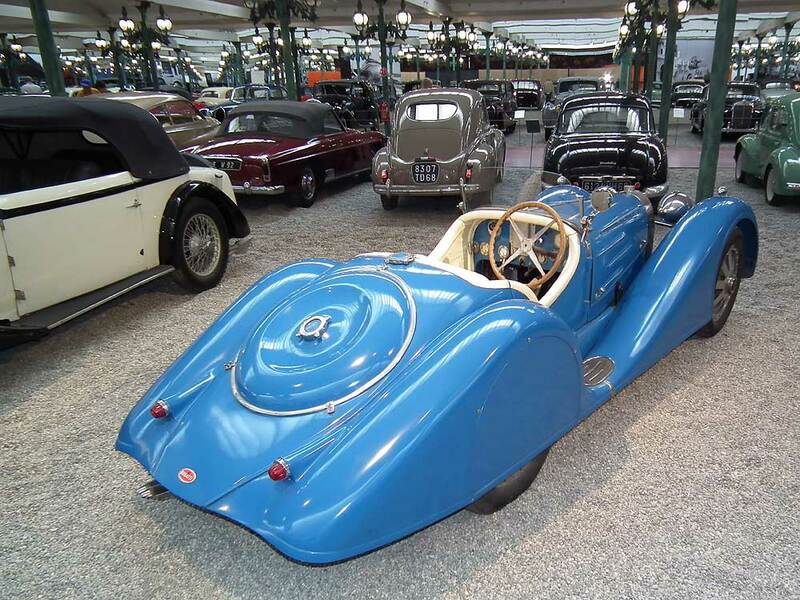 It was first performed at the Chateau of Chambord, for Louis XIV. Extra value was the addition of a small musical ensemble in period costume playing occasional music from Jean-Baptiste Lully. The musicians also sang and acted some of the minor roles. Although all of the performers are amateur the production was really good, and received with enthusiasm by the large (for Preuilly) audience. 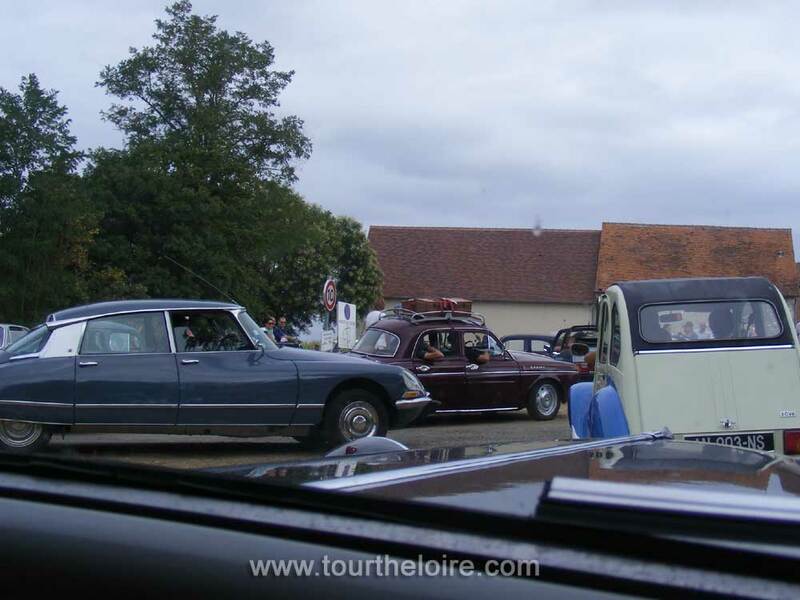 The "Troupe Prélude en Berry" was formed in August 2013, and tours the Indre and neighboring departments. They are based in le Blanc and comprise an acting troupe and a Baroque era music ensemble. Their theatrical productions usually premiere in Paris, and the music ensemble travels far and wide. The last time Susan and I saw any Moliere was 1999 in London (in English) with Eric Sykes in "School for Scandal". Friday was the first time I have seen a play in French, and we chose a good 'un - not too complicated or verbose, and not requiring masters level French to follow. Apparently the same ensemble visited Preuilly last year and we didn't go. Next year (hopefully) we definitely will. *spoiler: the disguises and false moustache work and the marriage is approved. Farmers in Switzerland don't have herds, they have carillons. One of the first things we saw on entering Switzerland was cows wearing bells. We were rather surprised that such a stereotype turned out to be true. The French phrase 'occupe-toi de tes oignons' means 'mind your own business'. This French company, Nature d'Origine, seems to have been occupying itself with Australian onions. Normally I buy onions at the market direct from a local producer, but I'd run out and did a quick supermarket shop for onions and other basics after we got back from Switzerland. I just picked up the onions that looked the nicest off the shelf. Imagine my surprise when Simon pointed out that the country of origin was marked as Australia on the label. 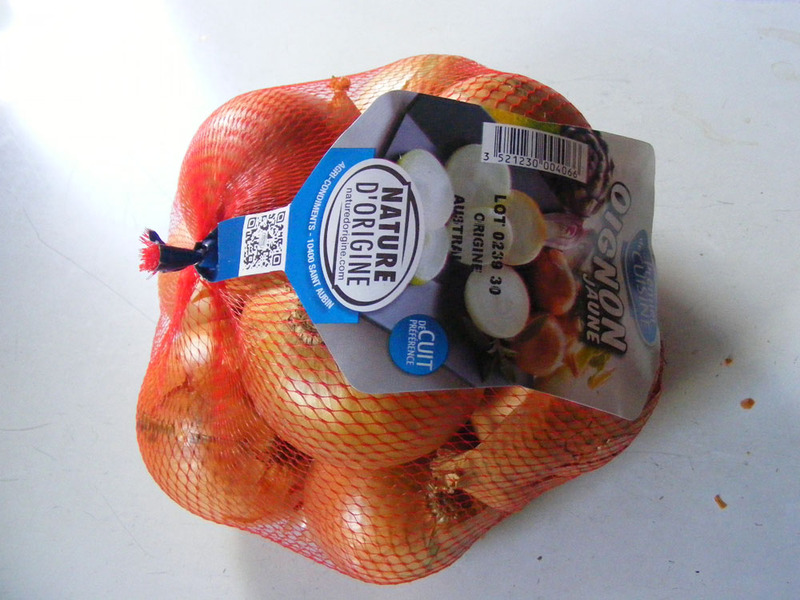 Nature d'Origine specialise in onions, garlic and shallots. They are based in Champagne and grow their own as well as import garlic from Argentina and onions from Australia (Tasmania) and New Zealand to tide them over the seasonal gap. Nature d'Origine is a division of Agri-Condiments (€50M turnover), which itself was taken over by Maître Prunille (€250M turnover and Europe's largest dried fruit producer) earlier this year. 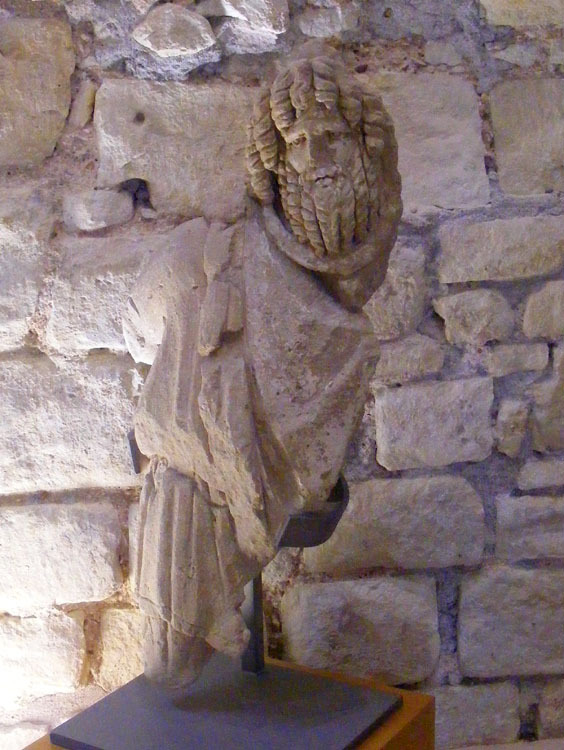 A Celtic figure, found in a local well in 2015. The visit of Simon's father coincided with the long spell of very hot weather here. What to do with an 85 year old with arthritis in a heatwave. 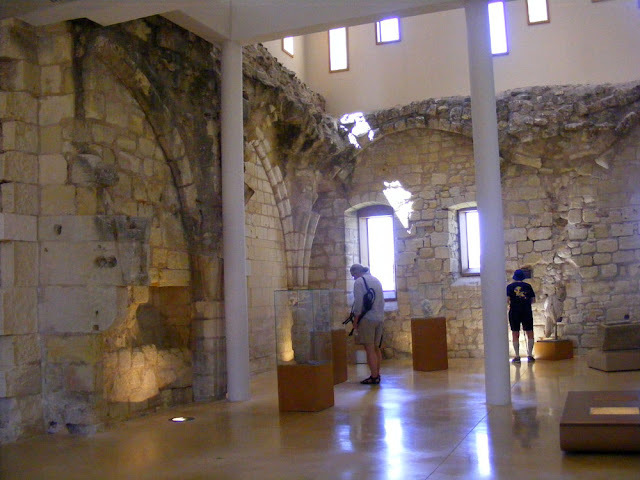 Why, take him to the Museum of Prehistory, which was air-conditioned and had a collection we knew would engage him. 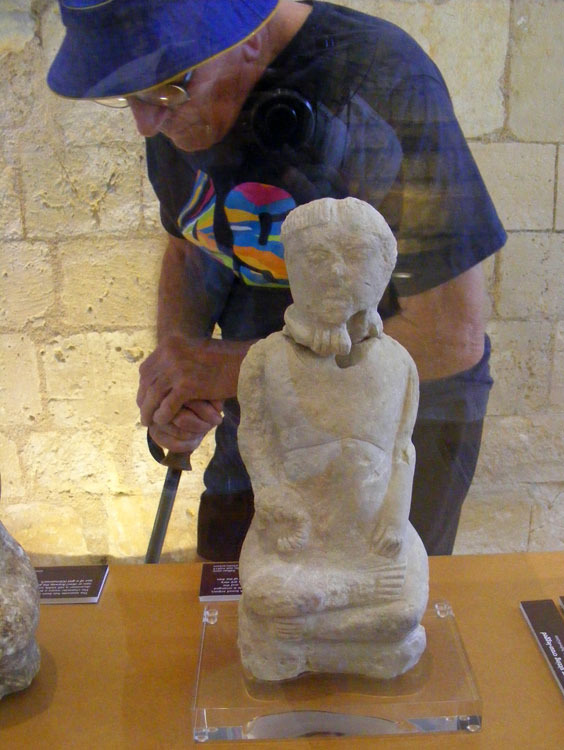 Ernie looking at an exhibit. is how the architect has borrowed the landscape. 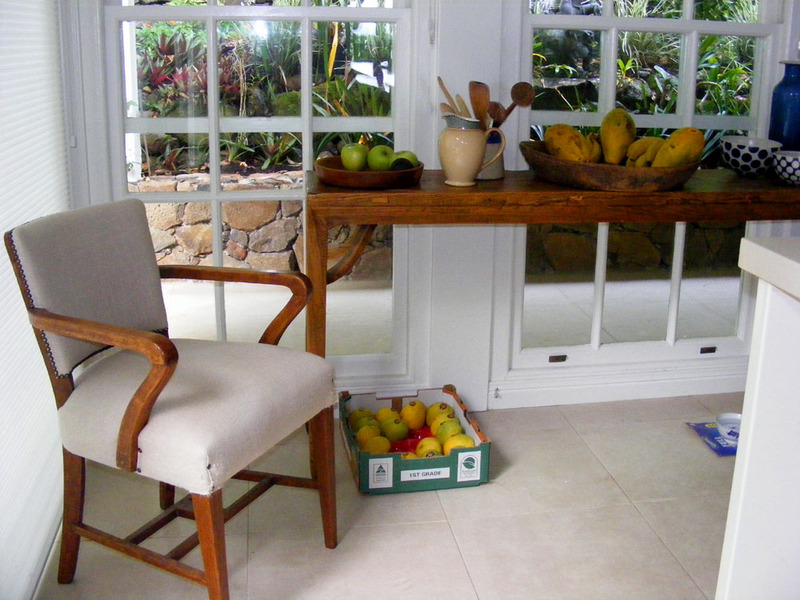 Another thing we love is how open and airy it is. 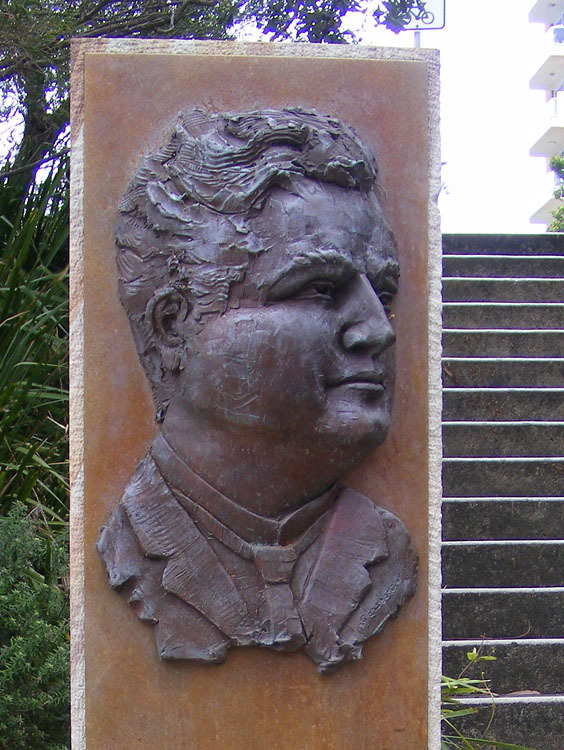 Edmund Barton was Australia's first Prime Minister, serving from 1901 to 1903, after which he was one of the first group of High Court judges in Australia. A bas-relief portrait bust of Edmund Barton in Manly. By all accounts he was sporty, jovial, persuasive, handsome, epicurian and politically moderate. His unkind nickname in the tabloids was Toby Tosspot. Despite that he was universally acknowledged as a scrupulously impartial judge and broadly supported as Prime Minister. Some years in Preuilly we see flocks of White Stork Ciconia ciconia as they migrate to or from Africa. 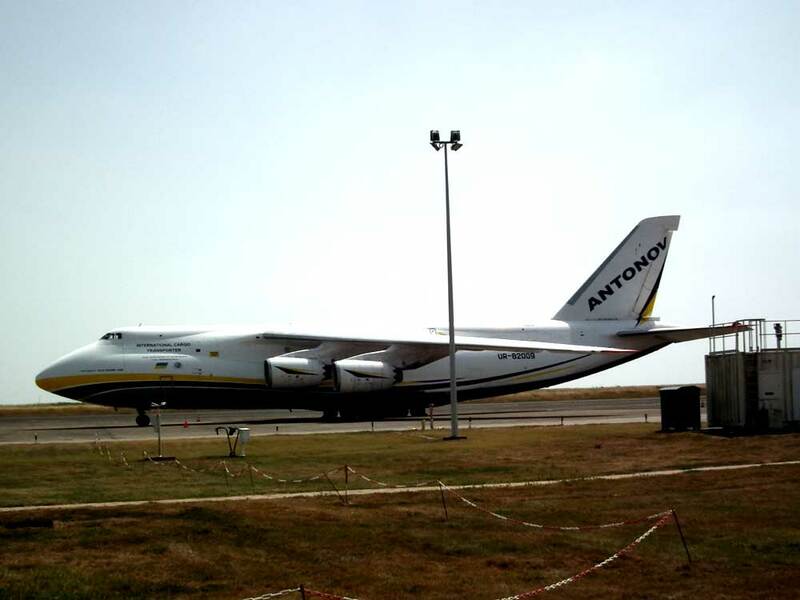 They are on their way to or from northern Europe where they breed. 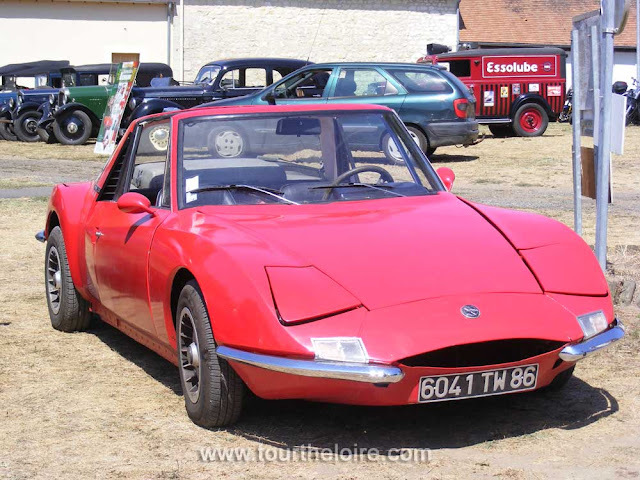 On Wednesday I saw one in a field near Yzeures-sur-Creuse. When we were in Mulhouse in July I was excited to see a few White Storks lazily gliding and circling above the city. I was super excited when we randomly came off the autobahn in Germany into a little village on the Danube called Geisingen. 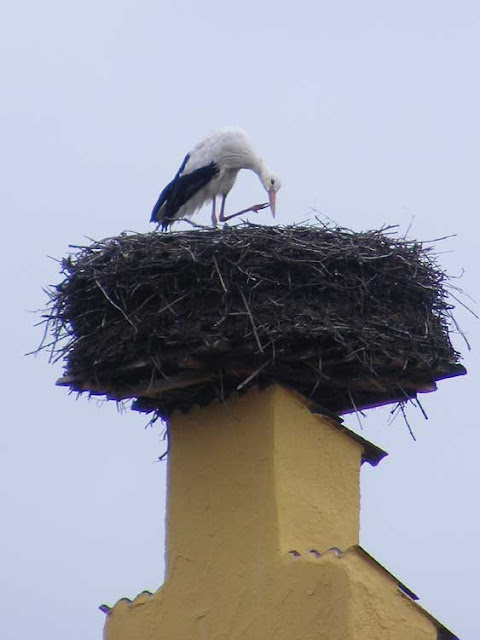 In the middle of Geisingen was a stork on a big stick nest on top of someone's house!! My first time ever seeing this. 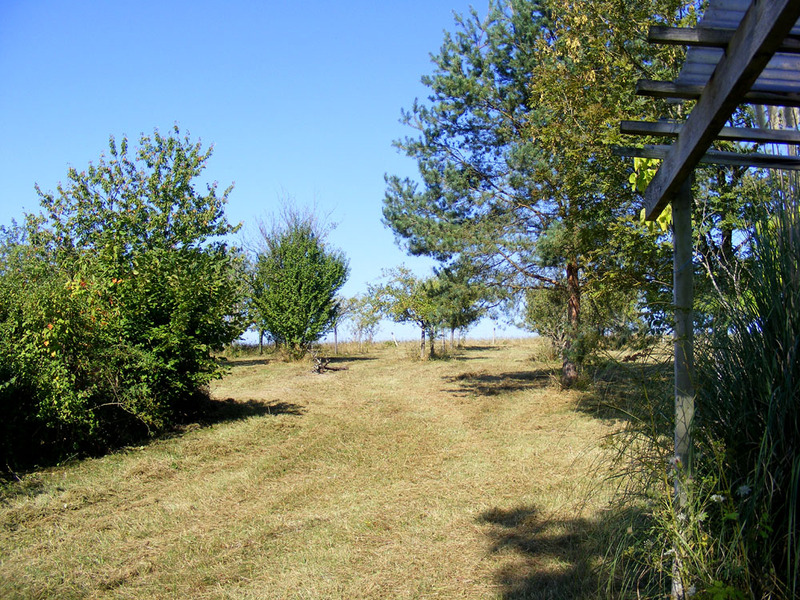 Geisingen is 2710 kilometres from the mouth of the Danube where it empties into the Black Sea. We crossed the river Donau (aka Danube) several times as we travelled from France through Germany to Austria for lunch (the obligatory schweineschnitzel and chips, with a beer). Storks feed in open damp meadows, grabbing insects and amphibians for their little ones. Because they are such strong and obvious migrators they were the subject of one of the first large scale banding and monitoring projects, conducted in Germany from 1906 to the outbreak of the Second World War. Storks wearing rings from this project were still being recorded ten years after the end of the war. The population of storks in France is under a thousand pairs and in Germany under 5000 (mostly in the east), so I think we were lucky to have seen the ones we did. The big breeding populations of 30 to 50 thousand pairs are in Poland, Ukraine and Spain. Whilst not now considered endangered globally, the biggest threat comes from changes of land use, where grazing meadow is ploughed up to grow maize. Although the area we travelled through has been traditionally associated with the presence of breeding storks, by the 1980s, the numbers in the upper Rhine Valley had dropped to 9 pairs. Only frantic and determined conservation work by a dedicated stork conservation organisation in Alsace and Lorraine saved the day. 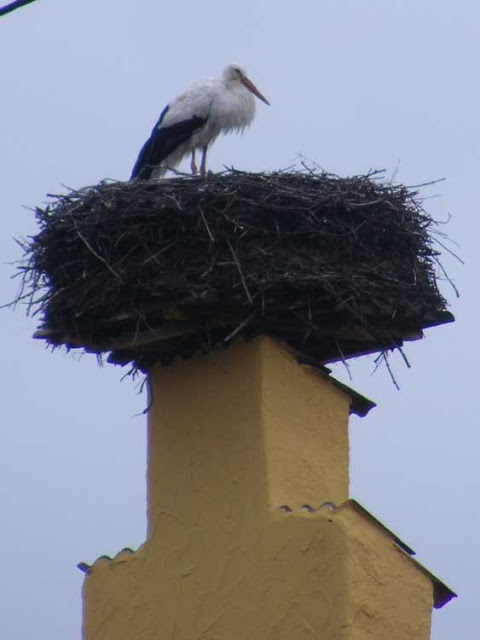 A stork nesting on your house is believed to bring good luck and harmony so they are positively encouraged. Last year we went on the Assumption Day (15 August) rally in Lesigny, and enjoyed it so much that this year we went back. Unlike last year we went unaccompanied, and until 7.00am had nothing to take for lunch apart from a melon. Then I made an onion tart, Susan bought bread and salad, and we were ready to go. The weather this year was a considerable improvement on last year - sunny most the time and warm, especially if you were in the sun. 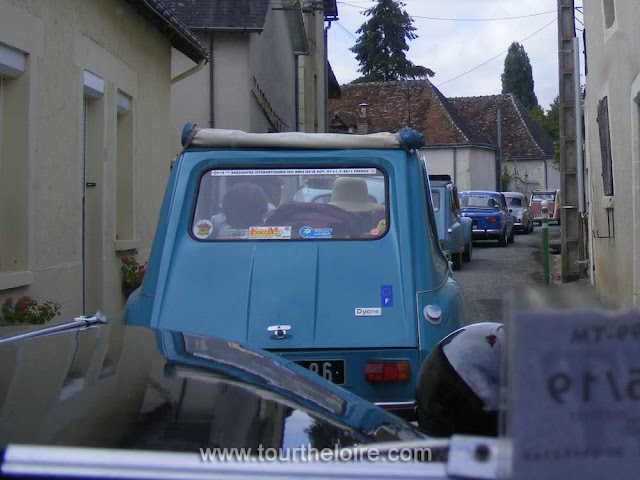 This mean that breakfast (bread, pork terrine, 2 types of cheese, coffee, red wine, brioche) could be taken without care for getting one's bread wet, and we could look at other people's cars rather than sit steaming in our own car waiting out the storm. 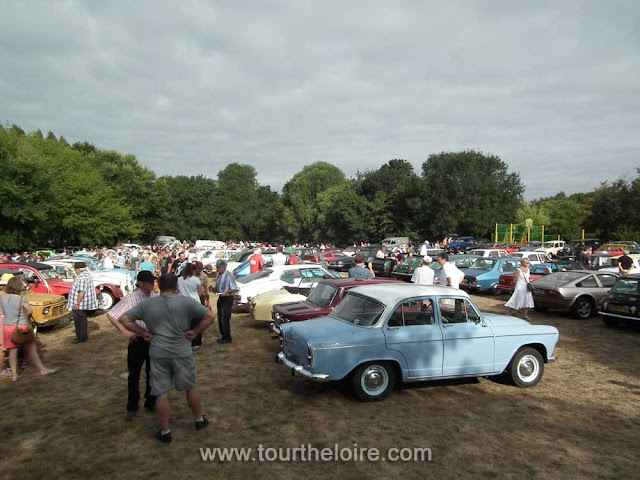 The progression was different this year visiting Leigné-les-Bois, Monthoiron, with a stop at Senillé for apero, before returning via roads even less travelled to Lesigny, a distance of about 45k. Lunch was spent in the company of newly made friends, with a discussion that wound its way to Brexit (don't get us started), with shared wine and toasts. All in all, an excellent day, and amazing value at completely cost free. This photo doesn't give you a proper idea of the vastness of the carpark. I particularly like idea that the drivers the two semi-trailers piled high with big bales of straw are in with us taking lunch. 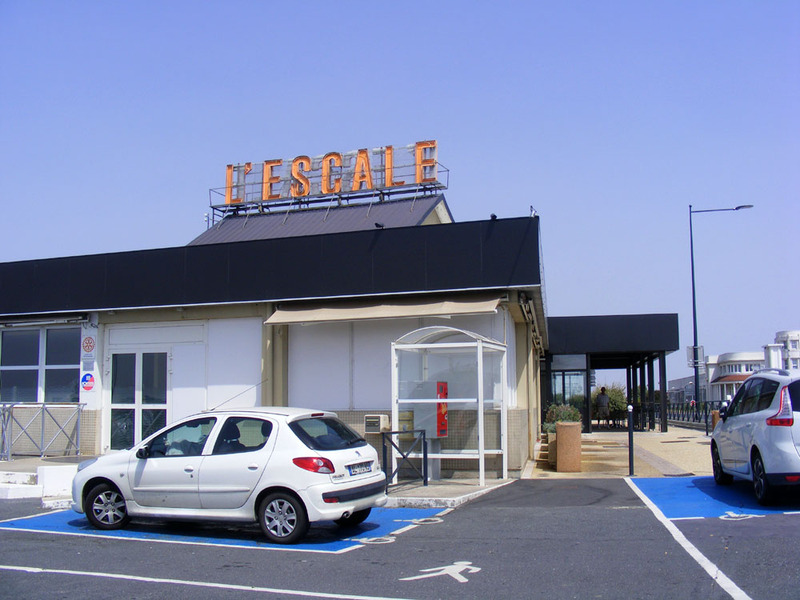 L'Escale Village at Déols, near Chateauroux, is a huge truck stop (one of the biggest in Europe apparently, and reknowned all over). 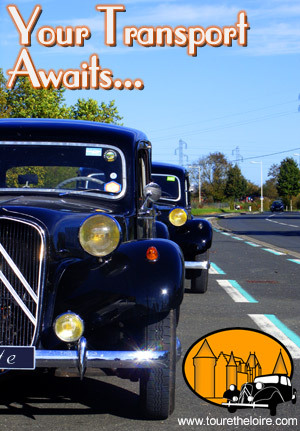 Situated just off the A20 (the autoroute known as the Occitane) it is open 24/7. There is a restaurant doing up to 600 covers a day and a brasserie doing 1500. They host conferences and do catering for events. Truck drivers can stop there, chill out in their own dedicated space, and take a shower. There is a shop where you can buy clothes and personal hygiene items. Wifi is free. 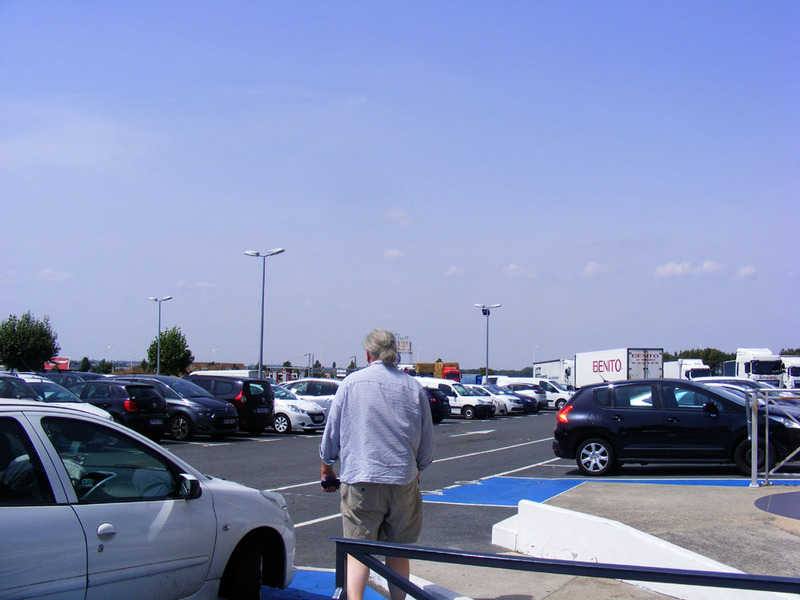 The 4000 square metre carpark takes hundreds of cars and dozens of trucks. It sounds horrendous, but actually it's rather good and we warmly recommend it. The staff, 85 of them in total, are friendly and welcoming and the food is excellent (and good value -- three courses in the brasserie is €17.90, €14 for a 'trucker's lunch', €9 for kids, up to €50 in the restaurant). -- lamb shank with mashed potato and roasted aubergine, followed by bombe Alaska. We've eaten there a couple of times, the most recent being with Simon's father before we dropped him off at the airport. The figures are staggering. 150 kg of steak a week, 120 kg of calves head (one of their specialities), 60 kg of salmon, 80 kg of kidneys, 3600 eggs. In the kitchen there are ten dishwashers, twenty chefs and five pastry chefs. The boss works 16 hour days, seven days a week and hasn't taken a holiday in 10 years. I recognised him immediately although I'd only ever seen pictures of him before. 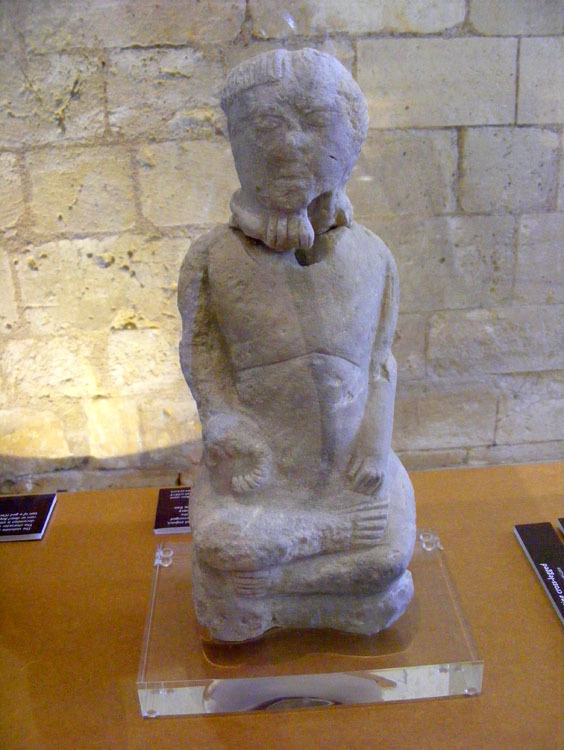 This statue is the only significant artefact to come from an archaeological dig around the base of the impressive Roman monument known as the Pile Cinq Mars. Now the statue is displayed in the Museum of Prehistory in Le Grand Pressigny. Although originally identified as a local god, the statue is a typical example of a 'captive barbarian'. 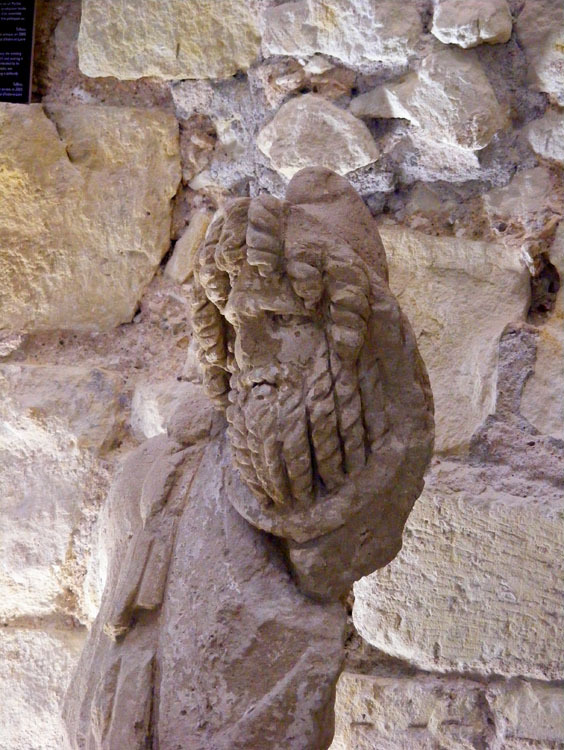 The hairstyle and clothing indicate he probably represents a warrior from Dacia or Parthia and the archaeologists think he was probably one of a group intended to commemmorate a local Turonian veteran. 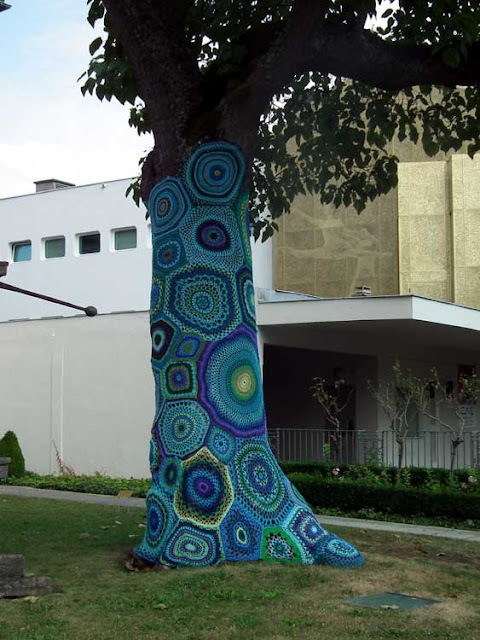 In March, April and May 2015 a large-scale artistic endeavor to dress the City Center of Mulhouse with color and thread was undertaken. Anyone who could knit, crochet or sew was invited to join in. I doubt if this tree in the grounds of the Musee des Beaux Artes is from the original project, and we didn't see any other examples, but we both agreed it brightened the place up. 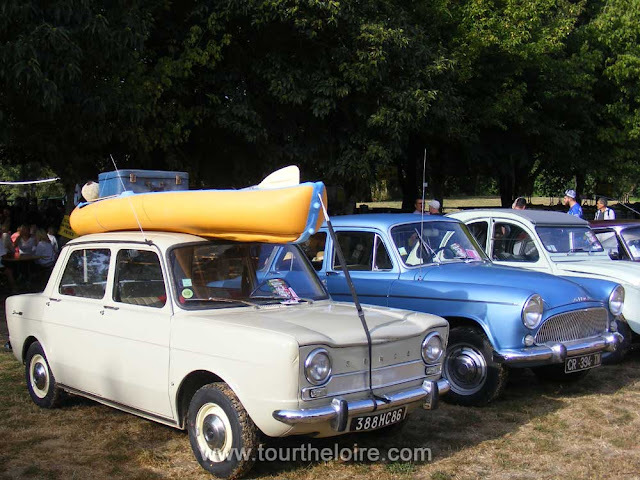 Last Tuesday Dad left France on the next leg of his trip, flying from Chateauroux airport to Southend on the Thames estuary east of London. 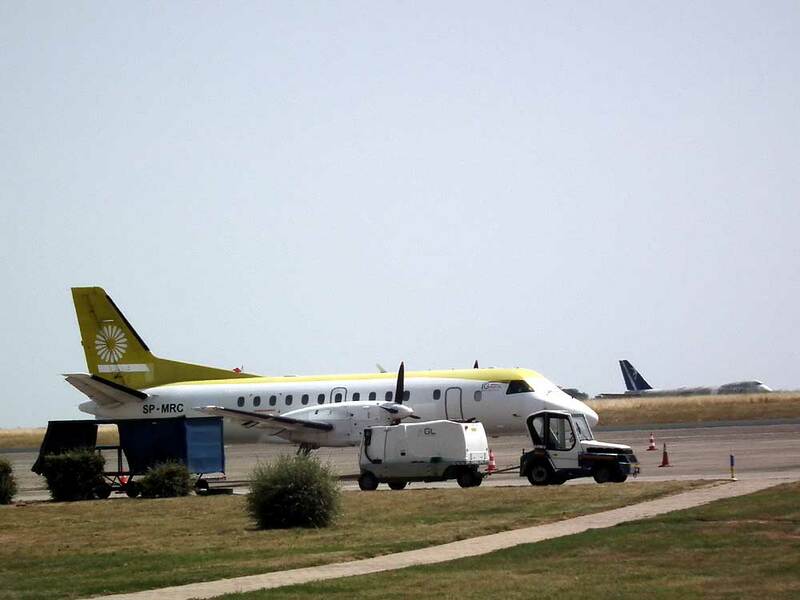 This is a new route operated by SkyTaxi, a Polish charter airline which operates some scheduled flights under the brand IGavion. A Saab 340A, one of the two planes in the IGavion fleet. The relatively new terminal has until recently been used only for holiday charter flights, mainly to mediterranean holiday resorts. There is (free!!) secure parking, a coffee shop, and because the airport is rarely used the staff are unstressed and friendly. The security guy apologised to Dad for making him pack his walking stick in his checked suitcase, but rang a friend in the pompiers (fire brigade) to ask him to come and help Dad to the plane. It has to be said that although the staff were friendly and efficient the flight wasn't without issues: we had to get Dad to the aiport 90 minutes before the flight because he had large luggage, which meant he then had a 90 minute wait alone in the lounge. The plane was then 1 hour and 40 minutes late leaving (reason unknown). I hope they kept him well watered, it was a very hot day. The airport terminal is a new building. 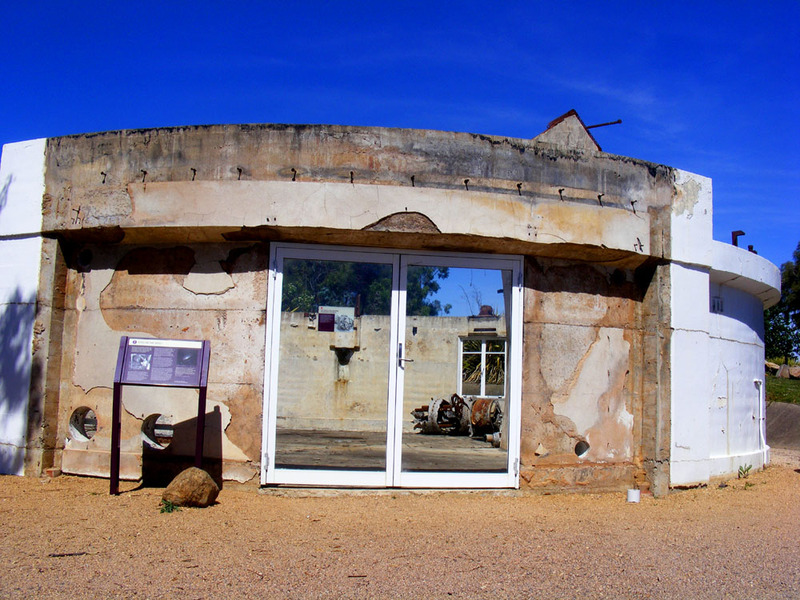 The airport has a long history, starting as two air bases in 1915 and building until 1918, when there were 3,000 people attached to the base. It then shrank somewhat until 1936, when the French Air Force based two reconnaisance and bombing squadrons here, and Marcel Bloch started building a factory on 157 hecatres of land (these building still exist and are listed historic monuments). 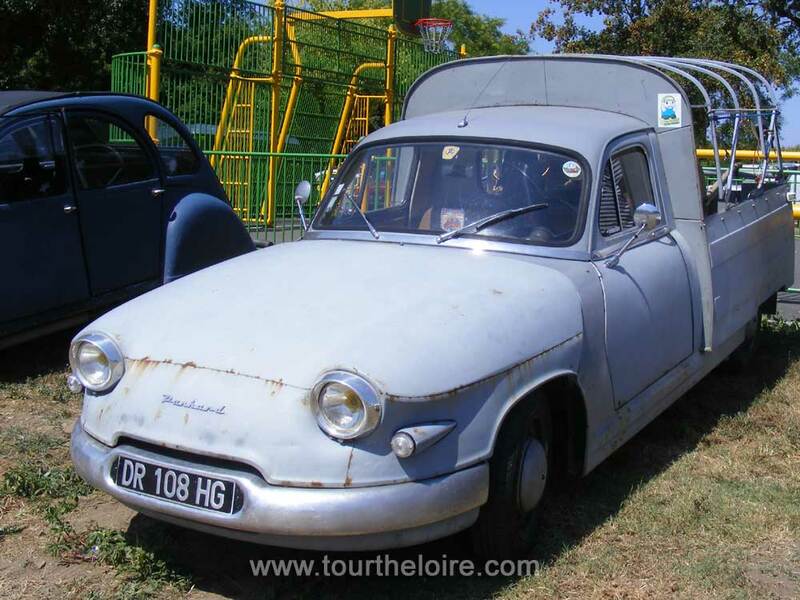 During World War 2 the Luftwaffe based two fighter squadrons here, then after the war the base was massively expanded again and became the biggest US Air Force base in France. Two service towns were built in the area, and for the time the Berry was once of the best places in France to be employed. An Antonov An-124 cargo plane, a regular visitor. 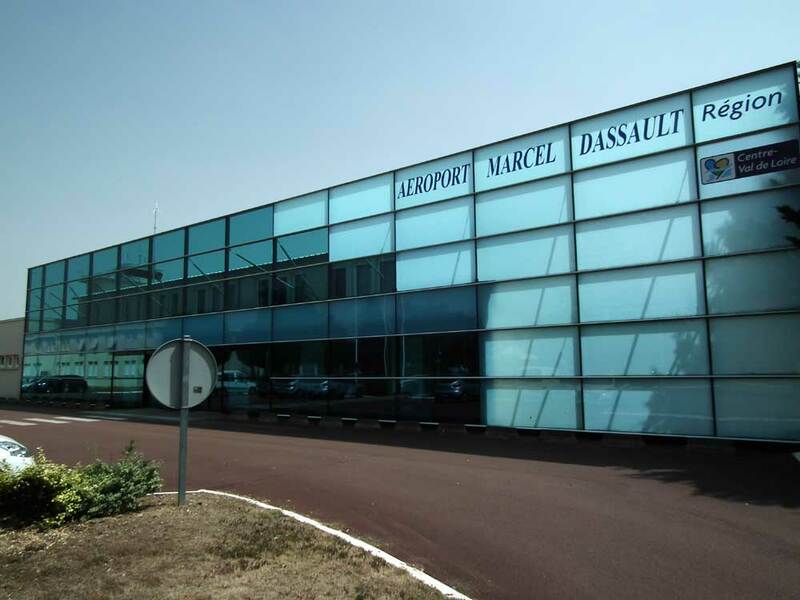 Although it is a busy airport capable of handling all sizes of planes, until recently there have been very few passenger flights from Chateauroux. The airport is the base of a number of aircraft recycling and repair businesses, as well as the place that all French aircraft fire-fighters are trained (C2FPA - the Centre Francais de Formation des Pompiers d'Aeroport). It also has a number of flight schools for commercial and military pilots, and until the year 2000 Concorde was a regular visitor for pilot training. 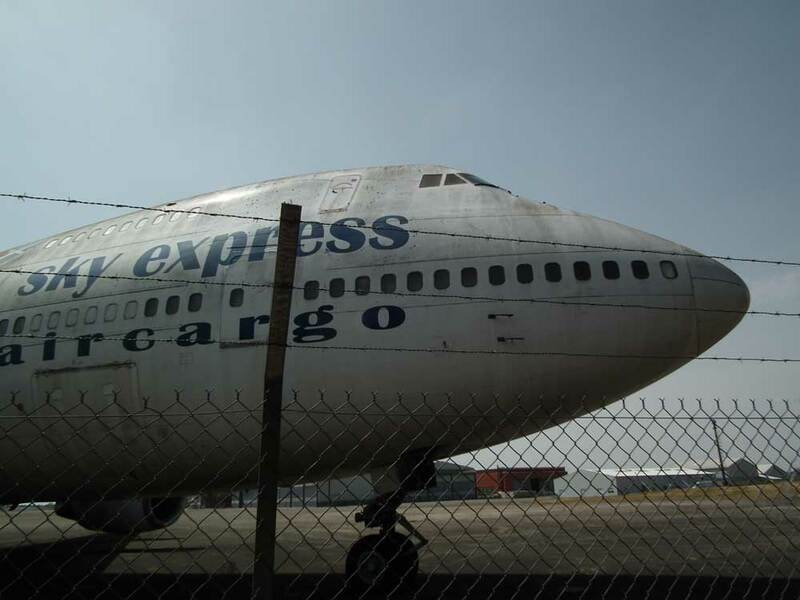 This Boeing 747-200 has been at the airport since at least 2008. 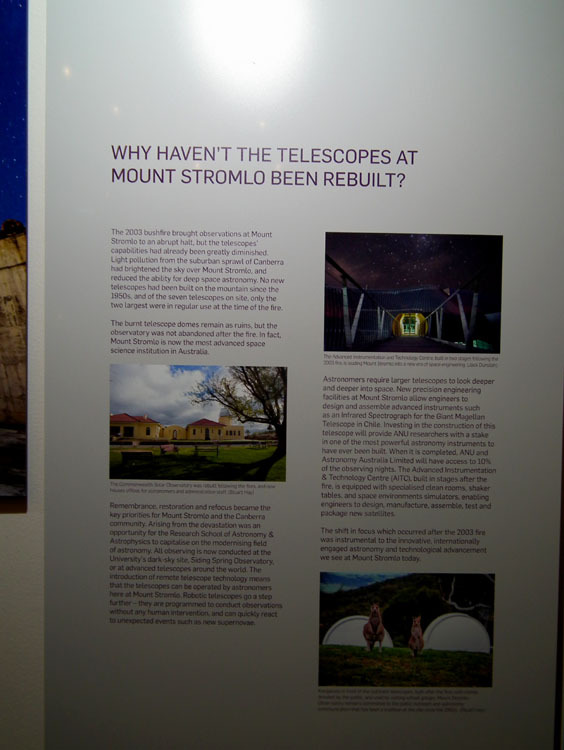 The Mount Stromlo Observatory, on the fringes of Canberra, has been at the heart of much cosmological research. 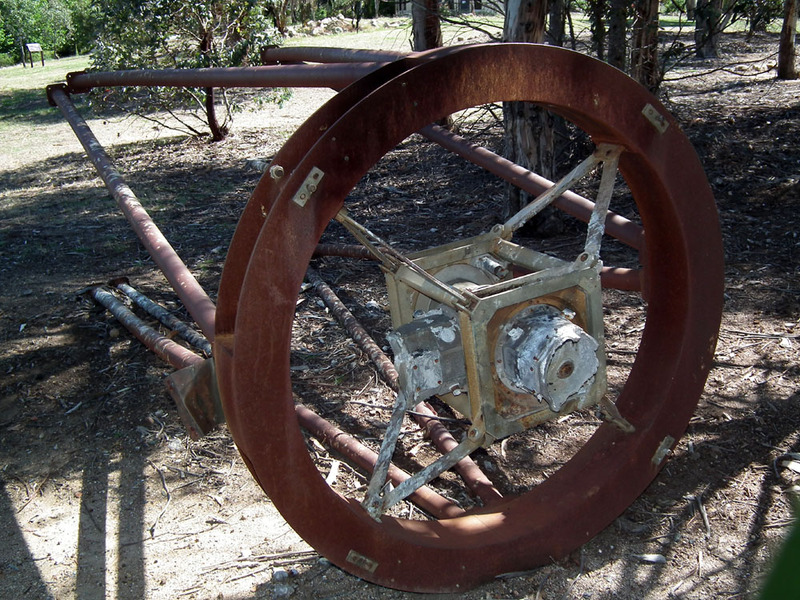 The latest in a significant list of research topics is the search for Dark Matter. Whilst it continues that important work to this day, what is most striking to the visitor on the ground is its function as a memorial to the 2003 bushfires, which destroyed much of the facility. 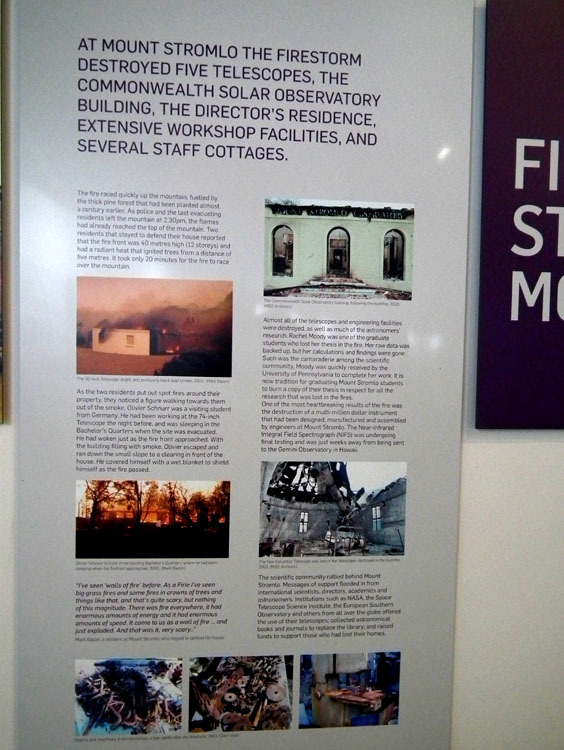 It is a very moving place. 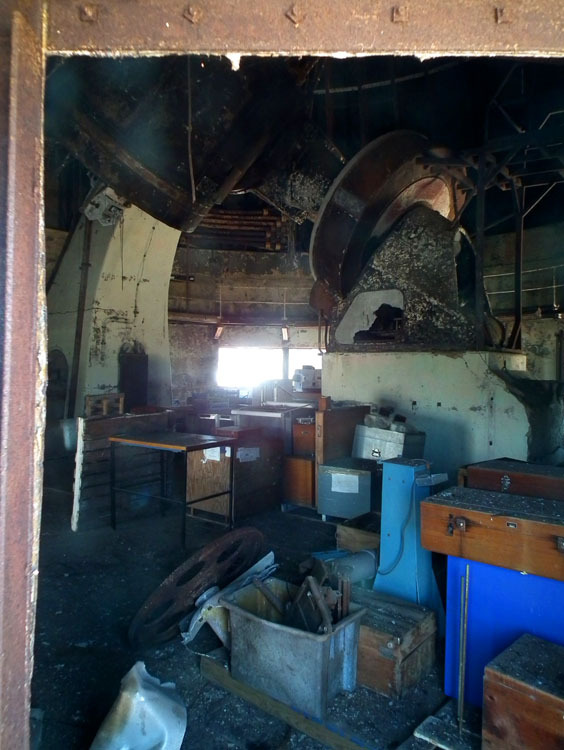 The ruins of the Yale-Columbia telescope building. Destroyed in the firestorm of 2003 the Yale telescope at Mount Stromlo was well travelled. 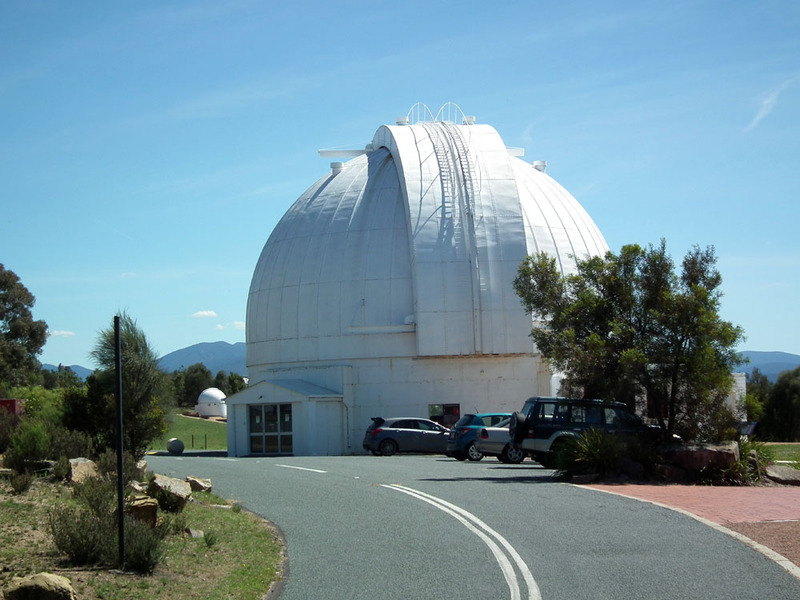 It was built in 1924 for a facility in Johannesburg in South Africa before being relocated to Stromlo in 1955. 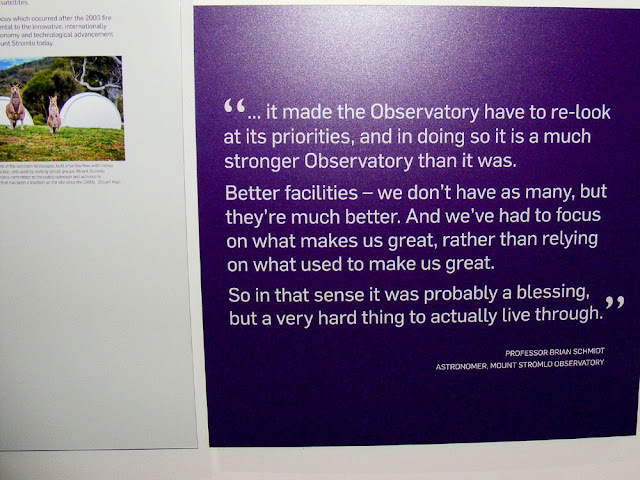 The Oddie Telescope was the earliest constructed on the site, in 1911, and last used for searching for supernova remnants in the Milky Way in the 1990s before becoming part of the Observatory's outreach programme, giving access to the general public to experience astronomy. View from the café (which is also a working astronomical building). 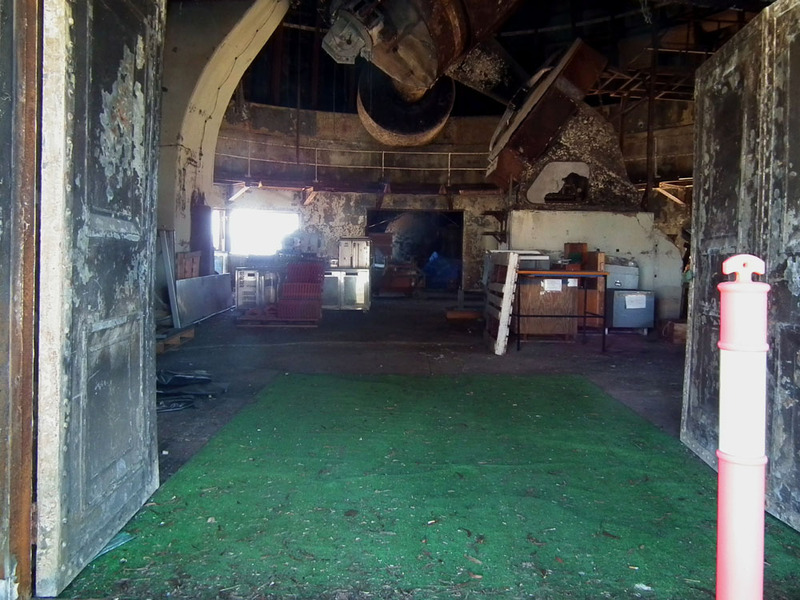 A view inside the burnt out Oddie telescope. 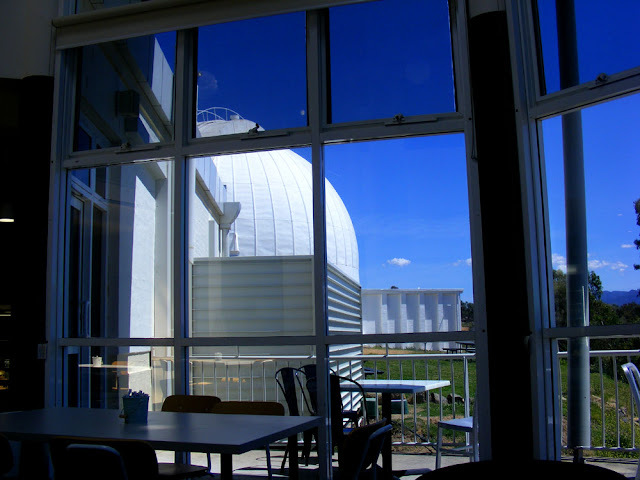 Another view into the Oddie telescope. 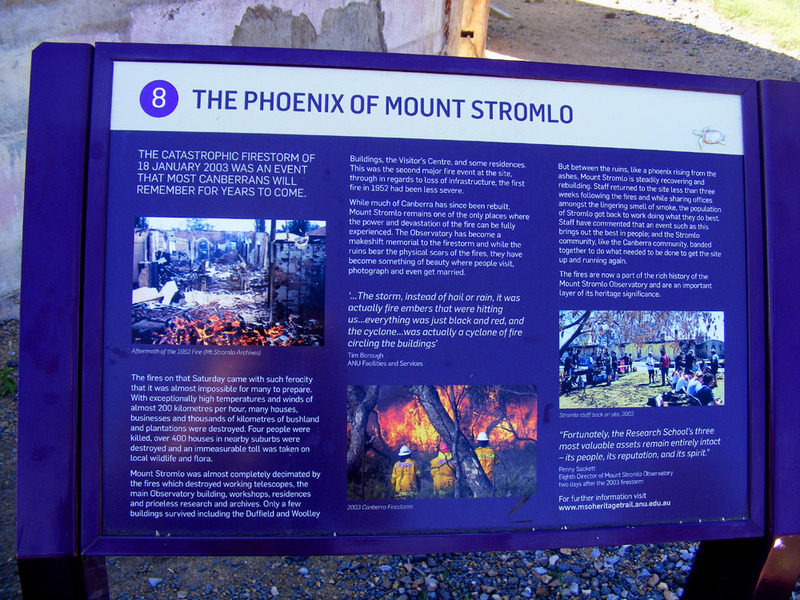 This view has only been possible since the fire. Part of an abandoned telescope mechanism.